MR4-MY system, Geminate region. On the 22nd of November at 20:30 EVE Standard Time, Imperium and Northern Coalition. [NC] forces clashed in the system. Northern Coalition. has deployed to the region for the past few weeks, busying itself with harassing Imperium forces by reinforcing infrastructure and destroying towers in an attempt to provoke fights from local entities. This has led to a series of battles with local Imperium forces such as Get Off My Lawn [LAWN] and The Bastion [BASTN]. Northern Coalition. assembled a 125 pilot Proteus strategic cruiser fleet. The goal of the fleet was to hit a jump bridge belonging to the Imperium in the hopes of provoking a response. As the force assembled, intelligence of an Imperium Proteus fleet of similar size moving through the region was received and the Northern Coalition. force attempted to ambush it on the jump bridge in the H-5GUI system in the Vale of the Silent region. After the Imperium forces jumped into the system and several of their pilots warped to the jump bridge, Northern Coalition. lit a cynosural beacon and bridged on top of them. While most of the Imperium’s Proteus fleet wasn’t present at the jump bridge and docked up instead in a system next door, those that were got caught and quickly dispatched by the Northern Coalition. fleet. With the Imperium fleet docked up, Northern Coalition. forces set to the task of incapacitating the jump bridge, hoping to cause the fleet to un-dock and engage them. However, for the next half hour nothing happened as the jump bridge slowly took damage. Finally the Imperium fleet undocked, but instead of engaging Northern Coalition. it chose to exit the system, traveling to the MR4-MY system next door and setting up on the in-gate. At this point Northern Coalition. had information of another Imperium fleet in the vicinity. Realizing they may be outnumbered and outgunned, the Northern Coalition. fleet commander explained the situation to his pilots, laying the two options on the table: Either retreat or stay and fight, possibly losing part of the force in the process. The pilots voted for the latter option and the fleet warped to the MR4-MY gate, jumping into the Imperium Proteus fleet. Once it loaded grid, the force quickly anchored up and exchanged fire with the Imperium fleet, starting the battle. The first exchange proved brutal with both sides trading ships as the Northern Coalition. fleet burned away from the entry gate in order to disengage at any moment. However, Imperium interdictors kept the fleet heavily bubbled, denying it a chance for expedient retreat. As the Northern Coalition. fleet kept losing mainline ships, two triage Archon carriers were brought to the field, helping it stabilize for a bit. By this point an Imperium Hawk assault frigate fleet had arrived to the system and swarmed the Northern Coalition. fleet, tackling many of its ships. Northern Coalition. quickly switched to the assault frigates which were easily volleyed, all the while hemorrhaging ships. By now the Northern Coalition. fleet commander realized a retreat was in order, and the fleet focused mainly on clearing interdictors and interceptors off the field. However, it was too late as two more Imperium fleets entered the fray, a Hurricane battlecruiser fleet and a Tengu strategic cruiser fleet. With 800 pilots in the system, Imperium forces started to systemically destroy the Northern Coalition. fleet, who could do little in return. It seems that Northern Coalition. did not know of the other two fleets burning to the fight, thus caught flat footed. While nearly half the fleet had been destroyed, the rest managed to warp off grid and escape the system, allowing Imperium forces to claim victory of the field. With no more enemies left to fight, Imperium forces left the system, ending hostilities for the day. Battle report for the H-5GUI and MR4-MY systems can be found here. All told the battle on its two parts lasted 40 minutes with local hosting nearly 1000 pilots at the end and Time Dilation being particularly bad, going back and forth from 40% to 20%. Northern Coalition. lost 65 ships including two carriers and 51 strategic cruisers for a total of 43.14 billion ISK damage. 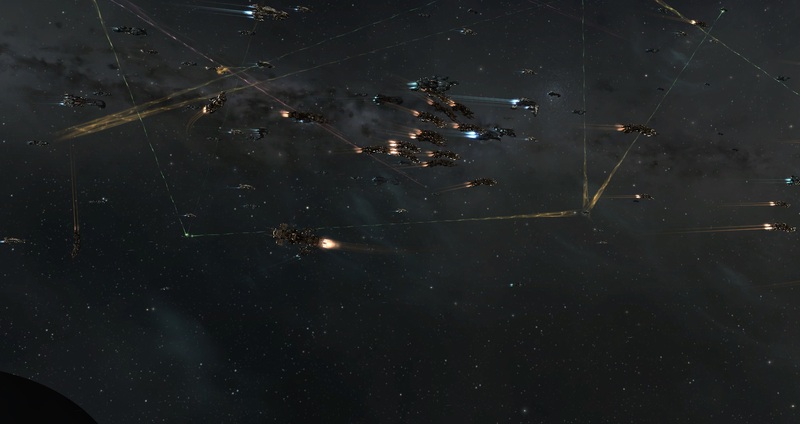 Imperium lost 122 ships including 6 strategic cruisers and 30 assault frigates for a total of 9.5 billion ISK damage. Just desire to say your article is as astounding. The clearness in your post is simply great and i could assume you’re an expert on this subject. Well with your permission let me to grab your RSS feed to keep updated with forthcoming post. Thanks a million and please keep up the gratifying work. you are in reality a just right webmaster. The site loading speed is incredible. It seems that you’re doing any distinctive trick. Also, The contents are masterpiece. you’ve performed a wonderful task in this topic! What blog websites would certainly benefit a small company in flower and also presents? Hello, Neat post. There is an issue with your website in internet explorer, could check this¡K IE still is the marketplace leader and a huge component of folks will leave out your magnificent writing because of this problem. Whats Taking place i’m new to this, I stumbled upon this I’ve discovered It positively helpful and it has helped me out loads. I hope to give a contribution & assist other customers like its aided me. Great job. I maintain several blogs & discussion forums and also enable individuals to write their talk about them. I check regularly and eliminate any type of vow words, etc. I also ask commentors not to leave any bad terms on the blogs/forums. However, that stated, am i still legitimately responsible for the content on my blog/forums if they create a vilifying remark or violent comments?. Lots of many thanks. What i do not understood is in fact how you are not actually a lot more well-liked than you may be now. You’re so intelligent. You understand therefore considerably in terms of this topic, produced me in my opinion consider it from so many varied angles. Its like men and women are not fascinated except it¡¦s something to accomplish with Lady gaga! Your individual stuffs great. Always deal with it up! MRkkDT Wow, superb blog layout! How lengthy have you ever been blogging for? you make blogging look easy. The entire look of your web site is fantastic, as well as the content material! I¡¦ll immediately seize your rss feed as I can’t in finding your email subscription hyperlink or newsletter service. Do you have any? Please permit me recognize in order that I could subscribe. Thanks. I have been surfing online more than 3 hours as of late, yet I never found any interesting article like yours. It¡¦s lovely value sufficient for me. In my opinion, if all web owners and bloggers made good content material as you probably did, the net can be much more helpful than ever before. Jy5ShL Thanks-a-mundo for the blog article. Awesome. Hi, Neat post. There is an issue together with your website in web explorer, may check this¡K IE nonetheless is the market leader and a big element of other folks will miss your fantastic writing because of this problem. I intend to start my very own blog site: exist such thing as blogs that are totally “open”, as well as any person can watch it? I maintain pertaining to the kind where you need to add other “friends” to use the website. Links valued. Thanks!. What are one of the most prominent blog site sites in the Philippines where I can submit my blogs for others to review? There are thousands of blogs that calls for comments on them. What is the intent of blog site remarks?. What is the best application for posting blog sites or short articles to my site?